Also known as the "Silent Killer", because most people don't show any symptoms of high BP. High BP causes the heart to work much harder (increasing the work load) which in turn causes the heart muscle to thicken & arteries to stretch. Being overweight contributes to High BP. The high levels of cholesterol in the bloodstream may lead to a build up of cholesterol (fatty substance) in the walls of the arteries. This reduces the blood supply to the heart which increases your risk of having a heart attack. Imagine bending a hose pipe & the water is not able to flow freely through it. 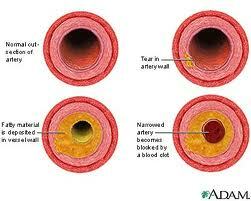 Cholesterol is influenced by the amount of fat we have in our diet on a daily basis. Especially the saturated fats! Smoking is the Biggest cause of heart disease. Each cigarette you smoke, shortens your life by 5.5 minutes (for 1 yr of smoking you can take off 1 month of your life). The more you smoke, the greater the risk of heart disease. Being overweight may lead to High Blood Pressure, raised Blood Cholesterol levels and even Diabetes. A lack of exercise generally leads to bad eating habits which in turn leads to weight gain. Regular exercise improves the functioning of your heart, lungs & muscles. Exercise also helps maintain and reduce body weight, regulates your BP & Cholesterol levels.